Warning AAP leader Arvind Kejriwal, he said the "extreme left-right ideological mix" of AAP and the "dirty politics"
KOTKAPURA: Punjab Congress chief Amarinder Singh today launched the last step of his poll campaign from here as he promised to bring back the innocent Sikh youths languishing in jails around the country, while attacking the AAP, which he said could throw the state back into violence and mayhem. Addressing a rally at Purani Dana Mandi here, the Congress chief ministerial face for Punjab canvassed for local party candidate Harnirpal Singh Kuku and promised cancellation of all false FIRs against Sikh youths lodged in prisons around the country and said they would be brought back to Punjab. Punjab was brought out of the throes of terrorism with great difficulty but with the entry of Aam Aadmi Party (AAP), the threat of violent disruptions and revival of terrorism has come back to haunt the people of the state, Amarinder said. Warning AAP leader Arvind Kejriwal, he said the "extreme left-right ideological mix" of AAP and the "dirty politics" being played by the Delhi chief minister would lead to the dormant Khalistani elements once again becoming active, thus throwing the state into violence and mayhem. The trend started by AAP was extremely dangerous for Punjab, he said, referring to AAP leader Manish Sisodia's remarks when asked to comment on Kejriwal's stay at a KCF commando's house. "What have they been doing for the past two and a half years," he asked, adding that such "inexperienced leaders" could not be allowed to take over the reins of a sensitive border state like Punjab. Kejriwal's only motive is to grab power without any concern for the consequences of his deeds, alleged Amarinder, cautioning the people against being taken in by the AAP leader's "false promises and propaganda". The AAP and its leaders cannot be trusted, he claimed, adding that as many as 17 party MLAs in Delhi had some or the other case against them, and even the AAP candidate for Kotkapura, Kultar Singh, had four cases pending against him. 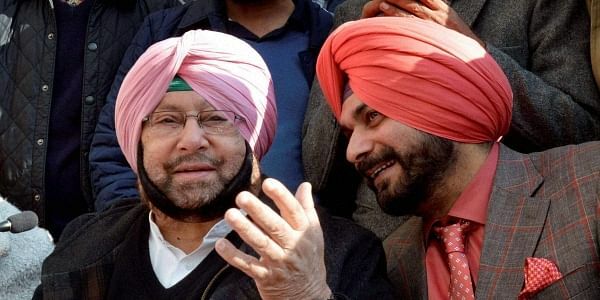 Amarinder decried the "pathetic conditions" into which Punjab had been plunged by the Badal-led SAD-BJP government, saying there had been an all-round decline under their rule. Predicting a total rout of both, the Akalis and the AAP, he said SAD will not get more than 10 seats in these assembly polls. Promising to bring back the lost smiles of the people of the state, he reiterated his promise of farm loan waiver and revival of industry. He also vowed not to allow SYL construction at any cost, saying he was prepared to go to jail rather than let a single drop of water leave the parched state of Punjab.